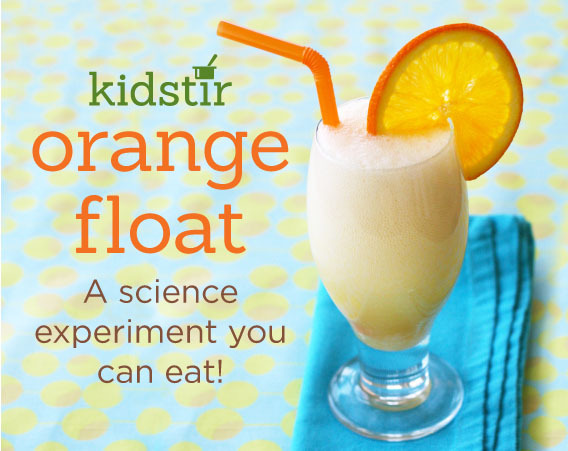 Looking for a science experiment your kids can sip? Try making an ice cream float. Make it two different ways and compare the difference. Which one fizzes up more? Try it out, then read below! 1. In one glass: Put 1 scoop of ice cream into a tall glass. Measure the sparkling orange juice and pour it over the ice cream. 2. In another glass: Put ½ cup of sparkling orange juice in a glass. Add the ice cream on top. 3. Which one fizzes more? Take a guess—and then sip your science experiment! 4. Note: A sparkling clementine juice is a good substitute for the Kidstir Sip Sip Hooray! recipe. Or, you can use ½ cup seltzer with a splash of orange juice. 5. Sipping Science Although both glasses have the exact same ingredients, the order you add them makes a big difference. So why does the float foam more when you start with the ice cream in the glass? That’s because ice cream has lots of tiny bubbles of air. When you pour soda on top, the carbon dioxide comes out and the drink bubbles up. Ice cream also contains thickeners. As you pour the soda over the ice cream, some of the ice cream melts and the thickeners mix with the soda. That’s why your float gets nice and creamy!